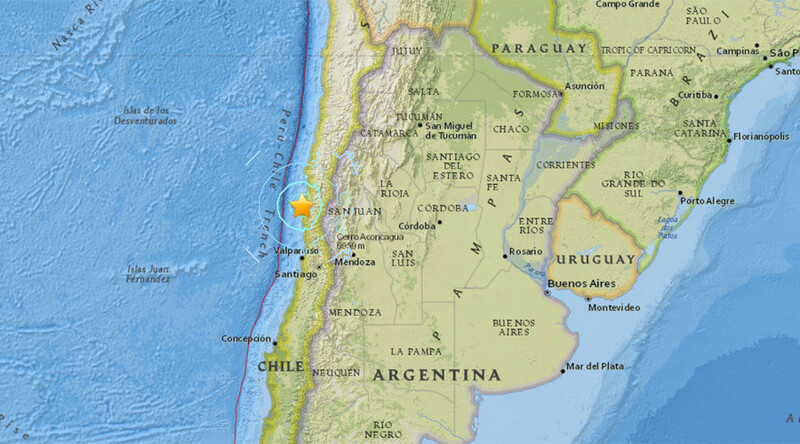 A 6.3-magnitude earthquake hit the Chilean coast, the US Geological Survey has reported. Powerful tremors were felt as far as Mendoza, located in Argentina’s Cuyo region. The quake struck at a depth of 31 kilometers (19.6 miles), with an epicenter about 79 kilometers (49 miles) southwest of the port city of Coquimbo, Chile, which has a population of more than 106,000. The nearest Chilean city of Ovalle (population about 104,000) is 40 kilometers (25 miles) from the epicenter, according to the USGS. The quake hit on Tuesday at 9:33 pm local time (00:33 Wednesday GMT). Previously, the USGS placed the epicenter about 196 kilometers (122 miles) northwest of the Argentinian city of San Salvador de Jujuy (population over 178,000). There were no immediate reports of casualties or significant damage. Chile’s capital of Santiago, which has a population numbering in the millions, is some 326 kilometers (203 miles) away from where the quake hit. Multiple homes were left without power following the tremors, Chile’s emergency office said. There were also reports of rocks falling on the highway. Meanwhile, the navy has confirmed that the quake was not powerful enough to trigger a tsunami. Chile stretches along the so-called Ring of Fire, where the vast majority of the Earth’s quakes occur. Also known as the circum-Pacific belt of seismic activity, the Ring marks regions where neighboring tectonic plates violently clash. Most recently, a massive 8.3 earthquake in September of 2015 triggered tsunami waves that inundated the Chilean coast, flooding the streets and forcing people to seek shelter on higher ground. The incident left at least 13 dead.